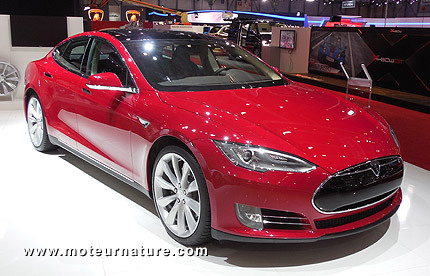 There’s no detail yet, but Tesla Motors said it had been profitable in the first quarter. At last! The company is ten years old, and most investors expect a start-up to make solid money in their third year of operation. So it took Tesla Motors much longer than what is normally expected, and it’s not victory yet. We’re waiting for figures, but there’s no doubt Tesla Motors will remain heavily in debt for a long time. But there’s something bigger coming. The EV market is still in its infancy, we mean very small. But most analysts had forecast that the Nissan Leaf would be the sales leader. It’s well built and affordable, and it carries the well known brand name of a big auto company. Nobody would have expected a start-up to be more successful than Nissan but this is what happened. The Renault-Nissan alliance puts out more than seven million cars each year, but when it comes to selling EVs in the American market, Tesla made more sales those past three months, with a car that costs three times as much as a Nissan Leaf. Many people will see it as a David versus Goliath remake where the little guy beats the big one, but it’s the other way around actually. The Nissan Leaf has average performance and poor range, whereas the Tesla Model S has phenomenal acceleration and a convincing range. Forget the high price. Progress has always been to go faster and further. It will be a shock to those who think the electric car should be small, affordable and restricted to city use. Market says says EVs should be big and fast. Tesla Motors is certainly heading this way. the Model S was available with 3 battery sizes. 40, 60 or 85 kWh. They’ve changed that: they won’t do the 40 kWh version. It’s the big battery, with convincing range, or nothing. Think big.